Saffron means "yellow" in Arabic because when used in cooking, it confers a yellow tint to foods. Harvesting saffron requires intensive labor; an estimated 75,000 flowers are need to produce just 1 lb. of saffron, according to the University of Pittsburgh Medical Center. As a result, it may have the highest market value of all herbs in the world. Unfortunately, saffron's purity is often compromised. Marigolds and other herbs are often added illegally to lower production costs. Be sure to buy saffron from a reputable source. Saffron contains medicinal substances such as vitamin B 2; crocin, a yellow flavonoid; picrocrocin, a bitter glycoside, and safranal, a volatile, aromatic compound. A physician should always be consulted prior to using saffron for medicinal purposes. 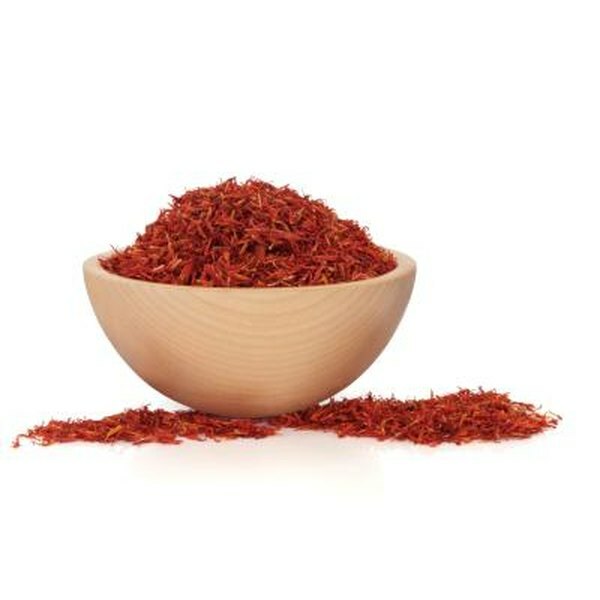 The NYU Langone Medical Center notes that saffron might offer benefits for those suffering from depression. According to the website, saffron has comparable efficacy to fluoxetine for depression, but reports that conclusive studies are still needed to make a firm conclusion. Saffron may be beneficial when long-term treatments are needed to alleviate depression because there are no known side effects associated with taking the herb medicinally. A study conducted by Professor Silvia Bisti at ARC Centre of Excellence in Vision Science and University of L’Aquila in Italy, found that saffron may slow or prevent age-related vision loss and treat macular degeneration. Saffron is an anti-oxidant, but it appears to have additional qualities that particularly affect vision. The researchers found that saffron may alter genes responsible for the fatty acid content vision cell membranes, which impacts the strength and resilience of eye tissue. Saffron contains compounds called crocetin and crocin that may improve memory and cognitive processing, These properties may be a useful for treating degenerative brain disorders, such as Alzheimer's disease, according to a study published in the "Journal of Clinical Pharmacy and Therapeutics" in 2010. Memory and cognitive decline are common disorders in the elderly population, and saffron is a relatively mild treatment that may be effective. Saffron may fight cancerous tumor growth according to website Drugs.com. The action of the herb is not known, however, saffron may prevent tumors from spreading while leaving the healthy cells unaffected. Saffron may also be effective used concurrently with some conventional cancer treatments, while leaving the medication's effects unadulterated. Journal of Clinical Pharmacy and Therapeutics: Saffron in the Treatment of Patients with Mild to Moderate Alzheimer's Disease: a 16-Week, Randomized and Placebo-Controlled Trial. Is Ginger Bad for Diabetics? What Are Some Common Uses of Saffron?